The Navy Emergency Response Management System (NERMS) is the Navy's Enterprise 911 solution that provides streamlined integration of data for emergency management and incident response. In the aftermath of the Fort Hood tragedy, the Secretary of Defense directed all DoD facilities to implement E911 policies...the Navy's answer was NERMS and an advisory from CNIC N37 that instituted base addressing (Advisory# EM2013-01). 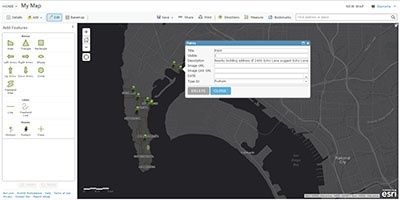 GISinc was contracted to execute the Navy Emergency Management Addressing Project (NEMAP), which will incorporate standardized geospatial addressing, numbering, and street centerline data into the Computer-Aided Dispatch systems at the Navy's Regional Dispatch Centers. Every Navy Installation at each CONUS region command must have standardized addresses for every building. The NEMAP team works with the Space and Warfare Command (SPAWAR Systems Center Pacific) and NAVFAC's Anti-Terrorism Force Protection Program to establish mutually beneficial relationships with the local governments surrounding the bases and capture the necessary life-saving data to integrate into NERMS. 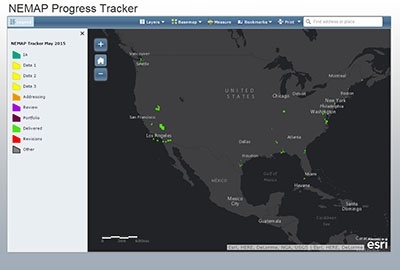 Through the NEMAP project, GISinc addressed all military bases within the Navy's CONUS region (65 commands and over 300 individual sites, more than 35,000 address points and 13,000 miles of centerlines) using a hybrid approach by combining Esri's ArcGIS for Desktop, ArcGIS for Server and ArcGIS Online platforms. 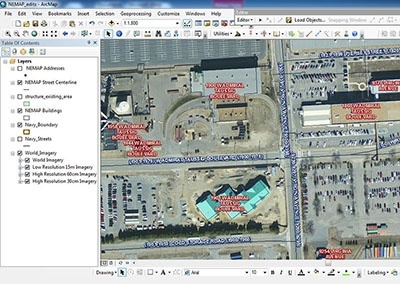 The team also employed GeoComm's GeoLynx DMS suite of tools for automated centerline range and address assignment. Two tangible products emerged from the project: an enterprise, geospatial database and the NEMAP Workspace. The geospatial data was designed to be integrated into local government and Navy e911 response systems to provide routable street addresses. This data decreases response times, a greater situational awareness and provides a higher level of efficiency in the overall workflow of first responders in emergency events. 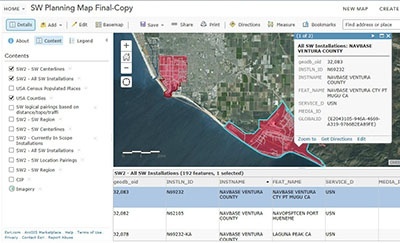 The NEMAP Workspace is a collaborative site built on the ArcGIS Online platform. It can be used by both local and Navy stakeholders to search for and review newly assigned addresses. The short learning curve allows all parties to be engaged while having little GIS knowledge. 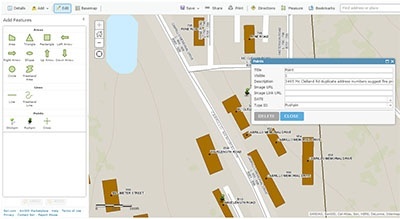 The NEMAP Facility Address Search Tool (NEMAP FAST) is a web application built for post-addressing, where long-term stakeholders can easily search for facilities to find their assigned address or aid in assigning addresses to new buildings/construction sites. The NEMAP Secret Sauce is the SOP put in place for new addressing in the Navy, and can be applied to other military bases as well.